OSMP is enacting a closure to protect cliff nesting raptors at Der Freischutz on Dinosaur Mountain — please see the attached map. The closure includes the BUBBLE and the Dinosaur Eggs formations. On Wednesday of this week, OSMP staff and volunteers observed that the prairie falcon pair that typically occupies Bear Creek Spire had relocated to the Der Freischutz formation. The pair’s timing is in the ballpark that if they succeed and fledge young, the formation will open with other closures on or about July 31st. As a result of the move, OSMP is lifting the closure for Bear Creek Spire. 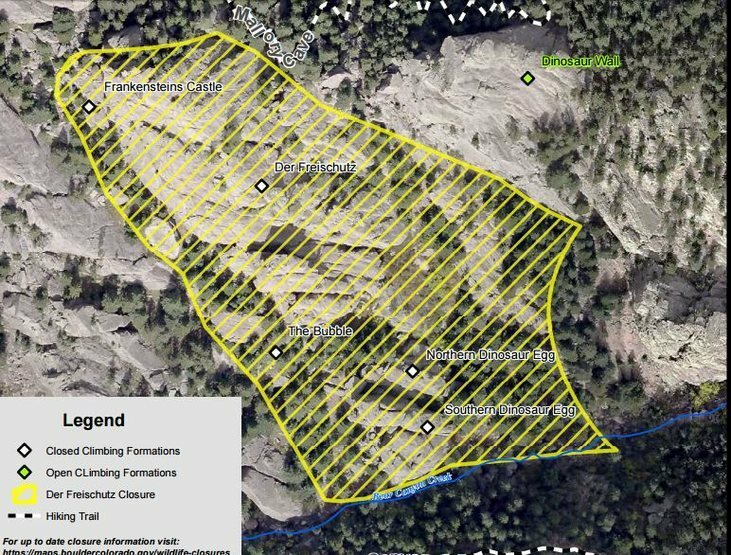 Those approaching Overhang Rock from Mallory Cave trail will need to approach from Bear Creek Spire going forward or until Bear Canyon trail is reopened. Click herebouldercolorado.gov/osmp/ba… for the bat closures. There are many rocks to explore in this area. In fact, this section of the Flatirions probably hosts the greatest number of distinct crags in the Flatirons. It is complex enough that even locals will get lost when climbing the more obscure crags here. The "Central" zone spans Bear Canyon arbitrarily to the Ironing Boards (just S. of the 3rd Flatiron). Those seeking solitude can find it here at the less-popular crags. Slabmongers can have many field days exploring the numerous mini Flatirons, and there's a lots of trad routes and even some sport routes among these rocks. There's even room for new routing. Have fun in this scenic setting. The main starting points are from NCAR (at the terminus of Table Mesa) for rocks near Dinosaur Mt/Skunk Canyon or possibly Chautauqua (off Baseline near 9th Ave) for rocks near the Ironing Boards. See specific rock pages for directions. Various of the Flatirons are closed for falcon nesting from Feb 1 up to July 31 and for bat nesting Apr 1 to Aug 31. Historically, some of these in this area have included Bear Creek Spire, Harmon Cave (bats), East Face of The Hand (bats), East Face of The Finger Flatiron (bats), East Face of Der Zerkle (bats), Dreadnaught, Achean Pronoucement, Skunk Canyon Ridge 2 & west, Sacred Cliffs, and possibly others. Mallory Cave is permanently closed to human use to reduce the chance of introducing white-nose syndrome. Please check with city of Boulder Open Space & Mountain Parks at 303-441-3440 before heading up there. Also, 303.441.4060 ext 420 & x 416 can provide information. ● What If You're Not? Photo: Dave Fiorucci. December 9, 2007. View of the Central Flatirons from NCAR trail. A slightly blurry, fun boulder problem. Sun set into Bear Canyon. Bouldering a new in Skunk Canyon. BH on new hb in Skunk Canyon. The area around the 4th and 5th Flatiron. MAN does this stuff like to grow in the Flatirons! The approach trail to Skunk Canyon. Guy- you are mistaken. Shadow and Skunk Canyon are not in the proposed HCA areas. The affected areas include Eldorado Mountain and the west side of Boulder/Green Mountains. AC, I found the following comment in the pointer listed below. Two new applications have come in so far for the September 15 cycle (close of the deadline) for the Flatirons Fixed Hardware Review Committee. Others might come along in the next month or two, as well. The Fixed Hardware Review Committee of the Flatirons Climbing Council will hold its public meeting Wednesday, July 6, at 7 p.m. at The Spot Gym, Boulder, Colorado, to discuss and vote on applications for the June 2011 cycle. Anyone interested is invited to come participate and cast votes for the three proposals (one of which is on Dinosaur Rock), which can be found here: flatironsclimbingcouncil.wo….